Wholesale Dickies Wet Gear does what it says by keeping you dry in wet conditions. We offer next day delivery and FREE delivery* check out terms for more details. We can brand your garments with your company logo or club crest for a small extra amount. If you have time please check out our best selling range of Dickies Trousers & Jeans. Dickies Wet Gear comes in a variety of designs and fabrics, but all aim to keep you dry using the latest quality materials. Dickies Fieldtex Waterproof Jacket is an ideal workwear item with a concealed hood, patch pockets with flaps and a double storm flap. This breathable, lightweight waterproof jacket is designed to keep the elements at bay and you and your stored work essentials dry. Dickies Vermont Waterproofs is a set consisting of a lightweight jacket and trousers that make up an ideal piece of workwear. 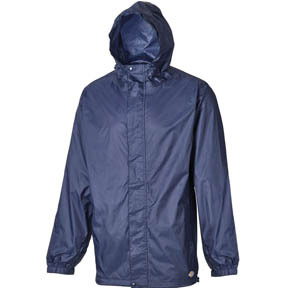 The Jacket features two pockets, hood and a drawcord hem. The trousers have an elasticated waist, two access pockets and a stud fastening at the ankle. Both are made using 100% polyester with PVC water resistant fabric, with taped seams. Dickies Wet Gear is second to none, just like our customer service, website, free catalogue and free delivery options.